Earn up to 92,495 reward points. Premium network data storage for high-demand environments. JMR’s enterprise class BlueStor Networked Storage Server is breaking new ground in performance, convenience and reliability. Powered by euroNAS software OS, the new 3U server is ideal for the corporate SMB, film, AV or streaming media markets needing to upgrade the performance and reliability of their shared storage environments in their existing IT datacenter or studio facility at a fraction of the cost of the competition. The system offers a multitude of enterprise features including 16 6Gb/s SAS/SATA disk drive bays, four (N+1 configured) high-velocity cooling fans, dual 620W (N+1) hot-swappable power supplies, dual internal SAS Expanders, four 1Gb/s NIC ports or optional Dual/Quad 10Gb/s and a high performance motherboard with an Intel™ Quad Core CPU. The Premium Ultra and HA Cluster provide support for our internal hardware RAID controllers, 10 Gb/s networking with 802.3ad link aggregation (LACP), load balancing and added failover features. The HA Cluster product (which requires the use of dual servers) is the ultimate for demanding environments where performance, data security and 100% availability are mission critical, and provides the features of Premium Ultra with complete redundancy and active-active server failover. In addition, the BlueStor Networked Storage Server is SES 2.0 compliant and provides real-time disk activity/failure status for every drive bay as well as physical user interface controls and indicators for power and cooling status with visible and audible alarms, plus front panel “on-off” and “reset” switches. The BlueStor Networked Storage Server, is unique in its modular design; it uses no cables in the data path, thus minimizing airflow restrictions and points of failure. 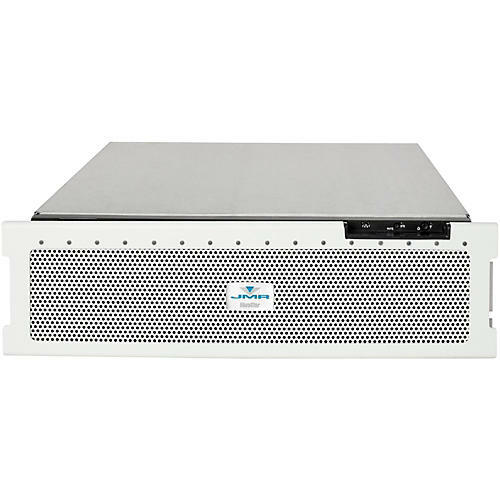 Like other BlueStorTM 3U rackmount products, it uses vertically-mounted disk drives in light weight, low-cost, vibration dampening disk drive canisters for the highest signal integrity and maximized air flow, resulting in lower drive temperatures and higher operational efficiency. The BlueStor Networked Storage Server provides fast data throughput thanks to network bonding, jumbo frames and GbE (10Gb/s optional) adapter support. The BlueStor Networked Storage Server is ideal for cluster environments thanks to persistent reservation functionality and high redundancy functions. The server also supports replication and snapshot functionality. iSCSI Target with support for VMware ESX, Microsoft Hyper-V, Citrix XEN etc. Fibre Channel Target with support for VMware ESX, Microsoft Hyper-V, Citrix XEN etc. High volume storage devices and expansions for film and music power users.